The “Jewel in the Crown: Old City Hall Station” was the first of the four New York Transit Museum excursions I signed up for during this, my first cycle of being a member, in spring/summer of 2011. I squealed when I first got the simple, one-page list of excursions and events in the mail and called on the first day of members-only booking days to get signed up for the ones I wanted, including City Hall Station. This overcast day came before I knew it and I left plenty early to get down to the meeting place, the downtown platform of the 6 train Brooklyn Bridge station. Indeed, I got there early enough to pop up from underground, explore, and locate brunch. I barely ever go to lower Manhattan. I thought to myself, “I’m never over here,” and then laughed because that’s just a defensive, face-saving way of saying, “I don’t know my way around this neighborhood.” I’m as guilty as anyone of using that phrase. Things did look somewhat familiar from scattered past trips here though: walking the Brooklyn Bridge with a friend, taking family members to historic sites, and a walking tour at the culmination of my History of New York City class a few years back. I had time so I wandered around a bit, consulting my smartphone GPS to get my bearings. Right at the south end of of City Hall park was St. Paul’s Chapel. I recalled times here – visiting not long after 9/11 when the gates were completely covered with tributes from around the world, and anecdotes my History of New York City teacher told of the chapel’s incredible survival during the tragedy and new meaning because of its role at that time. Over the chapel’s shoulder, the Freedom Tower rises, mid-build. The tall, symmetrically-positioned cranes on top stick up like antennae. While I’m not a huge fan of the specific plans for the site and architecture of the building (I think we could have done better), no one can deny that the building’s emergence where there was nothing for so many years is a powerful sight to behold. Construction was everywhere down here it seemed. On a neighboring corner another big building is going up. Sparks flew from a welder’s torch several floors up. I sat in wedged in a corner of the Starbucks for a few minutes, sipping and watching my time carefully. Only a few people passed outside the window underneath scaffolding where I sat. I departed soon, with just enough time to get back to the Brooklyn Bridge station still earlier than the tour was told to meet. On my way back I stopped to take pictures of other landmarks I recognized: the Woolworth Building, City Hall itself, the Manhattan Municipal Building (I had to look up what this imposing building was later), and the entrance to the Brooklyn Bridge. The first two I remembered, again, from my class’s walking tour. This whole area just oozes with history and its architecture suggests its primarily governmental purpose. And now it was time to go back underground. I descended into the station and made my way to the end of the platform specified by the Transit Museum’s coordinator on the phone when I booked my tour. I was a little familiar with the typical way one figures out if she’s in the right place from my rides on the holiday nostalgia train: Are there people milling around, not appearing to be in a hurry, with expensive cameras around their necks? I found this small crowd forming, and before I knew it a museum worker in an orange MTA vest showed up and began checking off names, attaching our wristbands, and handing out pamphlets about the station. As I waited, more people showed up for wristbands. I studied them, trying to figure out why each was there. Were they a dorky railfan/railien, photographer, family on an educational excursion, hipsters on a date, or something else altogether? Were their motivations for going on the tour similar to mine? A few non-tour people looked confused, as if they wondered why none of us were boarding any of the trains that passed by. I gulped down the rest of my iced coffee, figuring it would be a hinderance on the tour. And maybe partly because of the caffeine, tiredness, and/or energy I expended getting there and walking around already, my heart raced with anticipation. Even now I can’t quite describe the feeling. It was something like a combination of those situational factors, nervousness about the unknown specifics of the logistics and rules of the tour, anticipation of seeing and being in the place, and happiness and apprehension at being around potentially like-minded strangers. I was engulfed in thoughts of the City Hall Station – its past, the fact that it has sat there, perfect and virtually untouched for so long. Nostalgia for this place I’d never been or experienced overwhelmed me. I stared off down the platform away from the crowd and choked back tears: an effect of the nerves, sadness, and beauty. Not quite on time but soon enough our designated train arrived. Just the doors of one car opened and the now handful of museum employees who had joined us on the platform shooed us on board. We had to go quickly so as not to disrupt normal service. I knew we’d take this route southbound on the 6 train since, a while back, two friends sent me links to articles about the MTA beginning to let passengers stay on the 6 as it loops through City Hall to turn back uptown. Our train was aflutter with excitement. I couldn’t sit still. In what seemed like only seconds, we pulled into the station and in a seamless process, were escorted down a short, metal ramp and onto the platform. I was wide-eyed. The station was much, much darker than I imagined having seen pictures and this video I posted in one of my entries. We were whisked up to the mezzanine level. I tried to walk quickly so as not to delay the group, but I again had to hold back my tears. I was here, finally, in this beautiful place after so much buildup! Now all in the mezzanine, we stared up and around and the picture taking began – flashes every couple of seconds. Our tour guide spoke into an amplifier about the history of the station. I stood close to hear best. Each time a train squealed by (they’re loud because the tracks go in a tight curve here) he paused his speech and looked slightly exasperated. Finally he managed to get a few words in edgewise and then, with a few ground rules, sent us on our way to explore the station freely. Most of the 30 or so people on the tour spilled out onto the platform first so I held back on the mezzanine hoping to snap some pictures without many people in them. I walked slowly in a circle and stared and stared. The ceiling was magnificent. Muted green and white tile surrounded a leaded glass skylight. The symmetry of this, as well as the whole room was nearly perfect. Empty spots and truncated pipes were the only signs of where ticket booths and other structures used to. I had trouble picturing this gloomy, dark station as a bustling hub. Our guide had told us it was, indeed, this dark or darker when it opened. Because of the technology of the time, people weren’t used to bright lights at all as we are today. Our guide told us we could ascend the stairs that made up the original entrance to the station. Just don’t touch the doors at the top, he said, or else the police stationed at City Hall will be after us. I waited a turn then climbed most of the way up the stairs. They turned at a small landing, then the emergency exit doors were visible. It was quite strange to see doors in the ceiling! To give others a turn, I skipped down the stairs after I got my picture. I waited patiently back on the mezzanine for the area to clear so I could get photos of the arch leading to the stairs. I then descended the other staircase down to the platform. I wasn’t sure how long we had here so I thought it smart to move along. The platform was perhaps even more magical. Lovely vaulted ceilings and skylights were above us. The skylights were dingy in some places from being blacked out during World War II, according to what I’d read and our tour guide. But they were beautiful nonetheless. I wondered so much what piece of land we stood under at that moment. Light shone through, so these must be visible somewhere on the street level! I’ll have to return with an old map to see if I can figure it out. In some of the arches without skylights hung bare, plain chandeliers. One is missing, our guide told us, but if you see it listed on eBay don’t buy it, it’s not the real thing! What a strange little cautionary tale. Some of the most riveting moments on the platform were when modern, cold, steel trains rolled through this antique of a station. Especially after having seen and ridden on the historic subway cars before, the juxtaposition of eras was so strange. The station seemed quiet, serene, a secret treasure. The modern trains squealed by on their way to their regimented job in a hurry. And squeal they did! The tightly curved tracks cause friction and therefore an ear-piercing squeal during the train’s entire trip through the station loop. This is one of my favorite videos yet. There’s something powerful about the noise, particularly the howling, low whistle that one doesn’t typically hear from trains. The proximity of the glowing train to us in the darkness was also striking each time one passed. This train happened to stop in the tunnel just past the station, likely awaiting a go-ahead from the dispatcher. I proceeded to walk the platform from end to end trying to take in every detail. People especially gathered around the tilework announcing the station’s name. Some snapped flash photos of their loved ones in front of the crumbling but still beautiful mosaics. “City Hall” also crowned the wide archway leading to the mezzanine. The grand entry to these stairs appeared in contrast with the mezzanine, which looked murky and mysterious from this vantage point. Across from this arch were three plaques commemorating the creation of the station. They’re nearly impossible to read in the dark, so I used the flash. I walked slowly back to the first spot I’d visited on the platform – to the left as you get off the train or to the right as you come from the mezzanine. This end may have been a bit darker than the other, and at least at the time I hung out there, less popular. In wonder, I ran my fingers along the wall’s tilework and again got a little emotional. I was glad no one could see me in the dark and wondered if anyone else was touched in such a way. I watched more trains come through. I was struck by the gap between the middle of each train car and the platform, caused, again, by the extreme curve. It made sense now why we had to use a ramp to deboard earlier. Train going by – check out the gap! I felt so comfortable in my spot, even with trains passing close, that I sat on the floor (ground?) for a bit. It was dirty, to be sure (see my comment above about getting sick). But somehow it was still a beautiful experience. I felt closer to the place and it was more thrilling/scary when the trains rolled by. This picture, taken by propping the camera there on the ground, is one of my all-time favorites I’ve taken. All too soon it was time to get ready to go back. I may have even whined audibly at the announcement. I could have easily stayed in this glorious, solemn place for twice as long… or maybe forever. I vowed to go back, even if it is expensive. We boarded the train back to the normal, modern platform. I couldn’t believe it was over. The tour group dispersed quickly. I didn’t know what to do with myself, suffering a kind of fallout or withdrawal having to reenter the mundane world after being in such a charmed place. I ascended the stairs back to City Hall Park. My eyes scanned the park’s sitters and walkers. Were any of them on my tour? Would any of them talk to me about what we’d just gone through? I hung out on a bench for a few minutes trying to digest the experience and dissect my strong reaction of wanting to reach out to someone about it. Did this mean I should bring a friend on the next visit here (or to a similar place)? Or would that make me take it more lightly (not necessarily ideal)? I still don’t know the answers. Eventually I did have to return to normal, practical, everyday life. I eased into it, all the while City Hall Station on my mind. Since I was in the area, I took a quick shopping trip for a couple of articles of clothing as I had planned to do earlier in the day (as I said, it’s not often I’m in this part of town). I then wandered a bit more. I noticed yet more construction, then made a point to swing by Trinity Church, another landmark on my class tour those years ago. I thought I remembered this heavily-armored building too, the Federal Reserve Bank of New York. I realized I was making my way further from, not closer to, home so I decided to find a nearby 1 train stop and head back. My feet were getting tired, but even more I was emotionally exhausted. I called boyfriend, who suggested we meet at Fairway (as mentioned in pervious entries, the favorite grocery store) in west Harlem. While shopping is tiring too, I was content with this plan to meet up. I took the 1 train up to 125th Street. A check-in via phone revealed boyfriend was en route from his previous errand so I had a bit of time to explore the area. On trips through here in the car and on the train, I’d always been curious about this very tall station and wanted to have more time with it. I got off the train and walked to the northern end of the northbound platform to see what I could see. The view, though it included lots of construction (is this Columbia taking over Harlem controversy construction?) was pretty spectacular. Some distance away, Riverside Drive was visible above and the Henry Hudson Parkway below and closer to the water. Looking north, I thought about my next destination: finding where the tracks enter the tunnel towards the 137th Street station. I descended on steps, then a huge escalator, to be on my way. I thought I recalled photographing this (or a similar) escalator before, on my Riverside Park excursion. I had hoped to use this opportunity to get a closer look at the giant supports for the elevated platform. However, since Broadway’s traffic passes in between the sidewalk and the support and the structure has been under construction, there wasn’t an opportunity for a better look than what I often experience from the car. I walked north along the west side of Broadway with the tracks parallel to me and still elevated. Though that structure was of primary interest, I also watched the buildings, people, and vehicles on my walk. The walk seemed short since I had this new infrastructural goal in mind. I crossed the southbound half of Broadway at 135th Street and walked up to the stone wall topped with a chain link fence. People walked with their dogs and children all around and must have thought me strange standing there on my tippy toes peeking through the fence’s links. But I didn’t pay too much attention to them. It wasn’t long before I got what I came there for: a look at 1 trains, first exiting (southbound) then entering (northbound) the tunnel. The ground and the stone wall shook a bit when they passed by. It was almost time to meet up so I reversed my path and headed south for two blocks. I always forget which street leads directly to Fairway from Broadway, but today I guessed right and headed down West 133rd Street. Looking back, I saw another 1 train go by on the elevated tracks. Looking forward, Riverside Drive towered over 12th Avenue. I’d always seen the bus depot at the next corner, and sometimes been stuck behind busses pulling in or out of it. It seemed only fair to snap a photo of the busses for this entry containing so many trains! 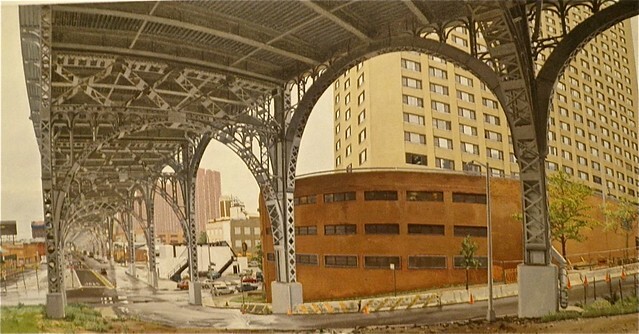 I scooted across 12th Avenue, marveling at the tall, steel structure of Riverside Drive above. Being underneath it makes me think of this painting by the talented Rackstraw Downes, pointed out to me a while back by a friend. I had just a minute to cross the street at the next block and visit a tiny corner of West Harlem Piers Park. This is another place I pass this all the time but would like to explore in the future. It’s got a pretty view and maybe some interesting sculptural elements? Too quickly it was time to enter Fairway and do our shopping. I bade farewell to my long, exhausting, rewarding infrastructure travels of the day and returned to normal life, but all the while counting down the days until my next Transit Museum outing. This entry was posted in Excursions, Museums and tagged Abandoned, Busses, Highways, Manhattan, Stairs, Trains. Bookmark the permalink. Emily, I again enjoyed your excursion. I hope to show Uncle Al. I know he will like it. Thanks so much! I’m glad you enjoyed and there’s much more to come!